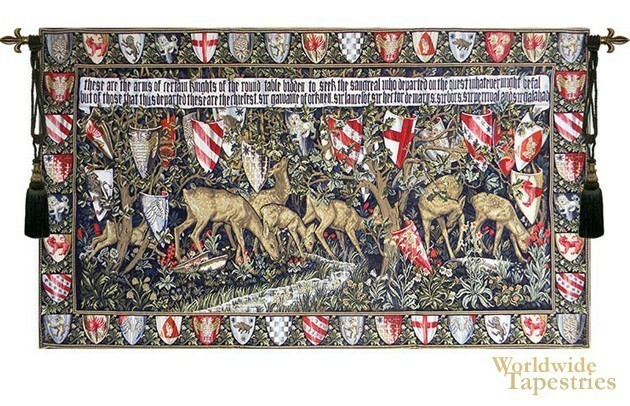 In this artful tapestry, “Deer & Shields”, the shields of the Knights of the Round Table are displayed around the edge of the work, creating a decorative border. The shields are shown in the forest as well, hanging from the trees. The knights were the individuals sent on the quest to find the Holy Grail, the vessel used in the Last Supper. The inscription on the top begins: “These are the arms of certain knights of the Round Table bidden to seek the sangreal who departed on the quest whatever might befall”. This tapestry is one of six panels that illustrate the search for the Holy Grail. The original is on display today at the Birmingham Museum in England. This reproduction is beautiful, and is lined and has a tunnel for easy hanging. Note: tapestry rod and tassels, where pictured, are purchased separately. Dimensions: W 46" x H 26"
Dimensions: W 68" x H 40"
Dimensions: W 92" x H 53"